Millions of acres of land have been contaminated by pesticides, improperly handled chemicals, dirty energy projects, toxic waste, and other pollutants in the United States and Canada. Technology has provided humans with an unparalleled standard of living,  but in the process has left a severely degraded and contaminated environment in need of recovery. With the health of our land, waterways, oceans, and human health at risk, how do we navigate out of these toxic times, both the past legacy, and what we will face in the future. 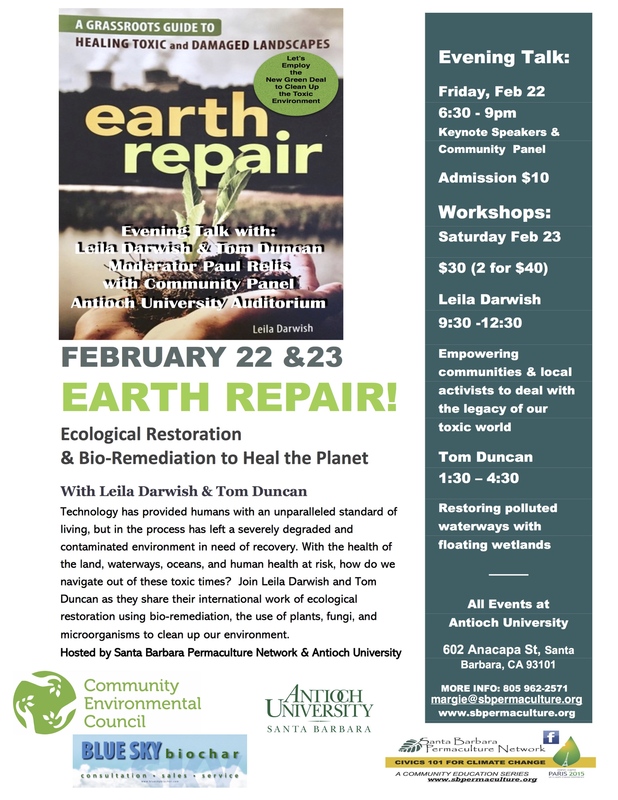 Join Santa Barbara Permaculture Network as we host Leila Darwish and Tom Duncan for a two day event as they share their international work and expertise with ecological restoration using bio-remediation, a process of detoxifying and revitalizing the land by working with plants, fungi and micro-organisms. 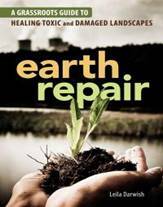 Leila Darwish is the author of Earth Repair, A Grassroots Guide to Healing Toxic and Damaged Landscapes <http://earthrepair.ca/>, who’s original focus was on oil spills, as she came from the Tar Sands region in Alberta Canada. Shocked by how ill prepared both government and oil companies were for cleaning up oil spills, Darwish was prompted to educate herself with a deep dive into the world of bioremediation. With a mission to empower citizens and communities everywhere to organize, scale up, and respond effectively to all kinds of industrial disasters where dangerous chemicals are released into air, water and soil, Darwish embarked on a career as a grassroots bioremediation educator and consultant. Darwish wants all citizens, especially those in the most vulnerable communities, to have the knowledge and skills needed to protect their families and homes. Tom Duncan’s bioremediation work takes the form of manmade constructed floating islands and wetlands. With all kinds of pollutants entering our waterways, including urban runoff, stormwater sediments, heavy metals from industry, and agricultural pesticides and fertilizers causing deadly algal bloom, these floating wetlands help restore ecological function by filtering and purifying with the use of microbes and plants. An entrepreneur devoted to the health of the planet, Duncan created the AquaBiofilterTM Floating Wetlands & Island Technology, to clean up polluted lakes, water bodies, rivers and estuaries. In addition to cleaning the water, floating islands optimize habitat for wildlife, and provide additional areas for food production. From supporting communities recovering from environmental disasters such as oil spills, to transforming urban lots to grow healthy local and accessible food, Leila will share her experience and expertise. The workshop is an introduction to the wild and regenerative world of bioremediation, exploring both toxic realities and radical remedies. The workshop will cover the how to's for microbial remediation (bacteria), phytoremediation (plants) and mycoremediation (fungi). It will also share important self-care practices (both herbal supports and protective gear) for earth repair practitioners working and living in contaminated environments. Finally, we will brainstorm ways to use bioremediation rooted in earth care and solid community organizing to support frontline communities responding to natural and environmental disasters, from oil to the aftermath of wildfires. What are manmade floating wetlands and islands used for? How are they constructed, and with what materials? Are they good for both small scale home and urban gardens, and large scale farming? What developments are taking place around the world with floating island and wetlands technologies? Can we bio-mimic nature’s wetlands to effectively clean up our environment? Join Tom Duncan,  founder of AquaBiofilterTM Floating Wetlands & Island technology, as he shares his years of experience and expertise designing wetlands systems large and small, for cleaning up toxicity, growing food, and providing enhanced wildlife habitat both above and below the waterline. We will explore case studies, technology and share ideas on wetland project implementation in catchments. An amazing opportunity to learn from one of the most experience people in the field, please bring your questions! Leila Darwish is the author of Earth Repair: A Grassroots Guide to Healing Toxic and Damaged Landscapes (New Society Publishers). Over the last decade, she has worked as a grassroots bioremediation instructor for different environmental organizations and community groups in Canada and the USA on campaigns such as tar sands, fracking, nuclear energy, coal, climate justice, water protection, and more. Darwish presently works in emergency management and disaster response in New Orleans, and has a Master degree from Tulare University in Disaster Resilience Leadership Studies; Bachelor of Science,  University Alberta Environmental Conservation Science, and Disaster Response Volunteer American Red Cross. As a community organizer, she has a deep commitment to environmental justice, food sovereignty, and to providing accessible and transformative tools for communities dealing with toxic contamination of their land and drinking water. Learn more: http://earthrepair.ca/ <http://earthrepair.ca/>. Since 2000 Tom Duncan has been building aquaponics systems in largescale and small scale aquaculture systems across Australia and China. His projects include the largest aquaponics systems in the world <http://permaculturenews.org/2014/10/14/worlds-largest-aquaponics-project-chinas-third-largest-aquaculture-lake/>, covering in some cases, many acres of aquaculture pond and lake with edible plants. In 2004 Duncan and a team of scientists demonstrated that polluted lakes across Asia could be completely restored, while also preventing future toxic algal blooms. Tom Duncan invented the AquaBiofilterTM Floating Wetlands & Island technology to clean up polluted lakes, water bodies, rivers and estuaries. Tom proved in the field and through quantitative modeling, that dedicating just 1% of farm and urban catchments to floating wetland ponds, would eliminate toxic algae blooms in lakes, rivers and estuaries. This protects the marine waters, gulfs and bays that receive run-off. Floating wetlands remove nutrients, suspended solids and pollutants, mopping up impurities and releasing clean water to rivers and oceans. Duncan served as Chairman of the Green Building Council of Australia for two years, developing the new Green Building Rating Tool.